There is nothing better than seeing your own work in print or on canvas. With so much photography staying in the digital world now, it is truly satisfying to have it in print. 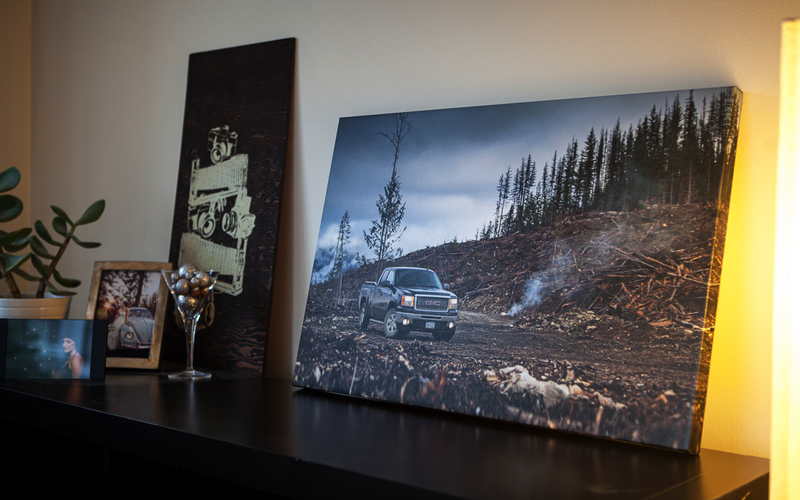 A client recently had this canvas made of a shot I took of his Dad’s truck while we were exploring the mountains just outside of Barriere, BC. He brought it by recently so I could sign it! It turned out great! A few months back I shot this Jeep for HPA Motorsports. It’s a Jeep YJ with a 1.9L Diesel lump from a 2003-2006 Volkswagen. I had the pleasure of driving the vehicle around to various locations to photograph it and man is it different. I am not going to lie, it was pretty cool being up so high(I am quite used to very low vehicles), and the TDI was something else. A blast to drive, but it was definitely a lot of work with those big mud tires. I have heard terrible things about the fuel economy of Jeeps, so I am glad that HPA has come along and given the option of a fuel friendly and torque happy classic American offroader.